The newest line of wheels being produced by new comer, Eclipse. I happily present to you, The Elure Wheels line; 011, 020, 021, 030, 031, 032, 033, 034, 037, 041, 044, 045, 046 & 047. Consisting of several models in either Chrome, Gloss Black, Machined Faces, Pinstripes, and even designs with inserts of an artistic and elegant nature. More than a few of these wheels come in not just 5 lug, but also 6 lug bolt patterns, for almost any wheels buyers desires, or preferences. My favored model from the Elure line would have to be a toss up between, the Lotus Flower looking design of 046, in a chrome finish or the, 033 wheel in Black with Machined Face Pinstripe & Metal Center cap that causes neck to crack as they do a double take. 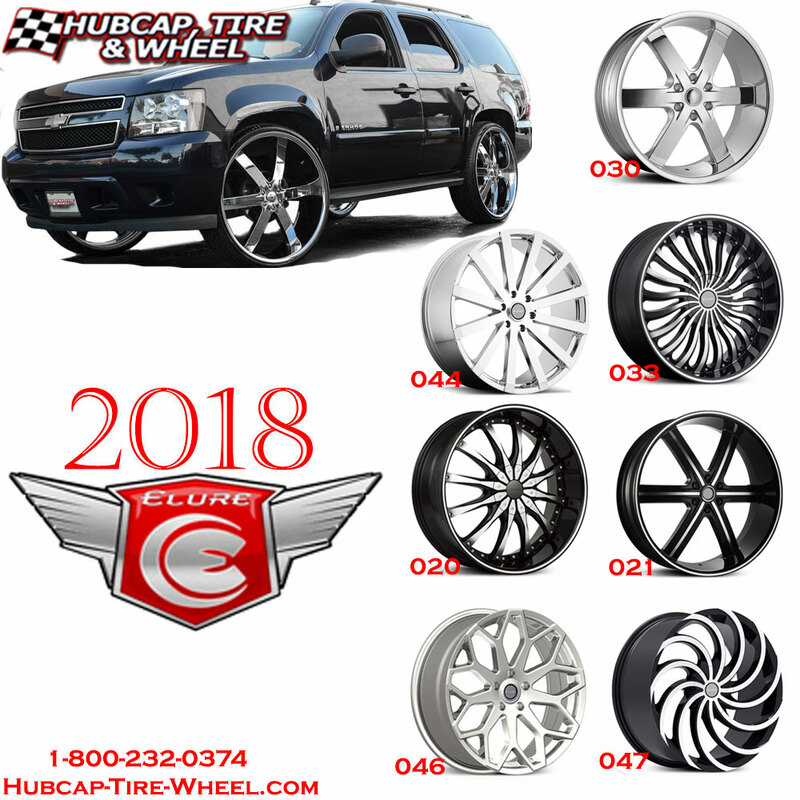 If you have any questions at all in regard to the new Elure wheels lines, or any other wheel brands, please feel free to give us a to call at 1-800-232-0734. Our business hours are Monday – Friday 8:30 am until 6 p.m & Saturdays from 9 a.m until 4:30 p.m. Our wheel and tire experts have been doing this for a long time. With over 100 years of combined experience, they know what they will ensure you procure the exact wheels and fitment you are searching for, no issues whatsoever. In fact, we have so much confidence in this industry that we offer a guaranteed fitment or your money back policy. When you order a set of Elure wheels along with any tires, we don’t want you worry about anything other than making sure you have a camera ready to capture pictures to show off to your friends on social media. We will even mount and balance your wheels and tires for free. That way, all you have to do is take them out of the box and place them upon your vehicle. No struggling, no hassles, no worrying.